One of 12 monarch butterflies that Valerie Velvet raised at her home in southern New Jersey last summer. Monarch butterflies – those aesthetically pleasing creatures with orange, black and white markings – tend to improve any line of vision they enter. They’ve also become increasingly rare in this area, and the other regions they call home in the eastern or western United States, the Great Plains or Canada. The trend, with populations declining since the late 1990s, has prompted concerns for the invertebrate’s future. As far as local monarch butterflies are concerned, some good news came out of Mexico last week. Despite years of dwindling populations, the number which migrated to mountainous regions of central Mexico – their destination from Canada and parts of the United States for hibernation in pine and fir trees during the winter – has rebounded. A recent count resulted in the highest numbers in 13 years. 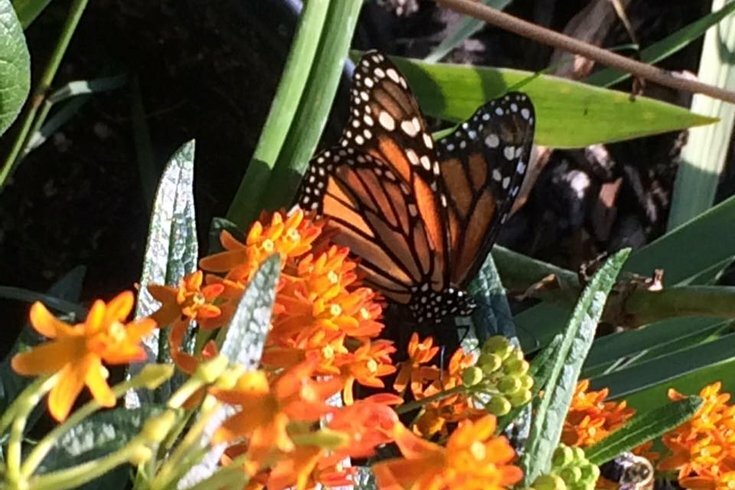 “This reprieve from bad news on monarchs is a thank-you from the butterflies to all the people who planted native milkweeds and switched to organic corn and soy products,” said Tierra Curry, a senior scientist at the Center for Biological Diversity. That doesn’t mean enthusiasts will cast aside a five-year effort to grant them Endangered Species Act protections, though. It’s merely a positive sign amid what Jon Gelhaus, curator of entomology at the Academy of Natural Sciences of Drexel University, termed a troubling trend. With questions lingering about the causes of population decline, the monarch’s future is still clouded in mystery at a time when their west-coast peers fly toward the brink of extinction. In a small way, one South Jersey woman – and like-minded people across the country – have helped reverse that troubling trend. Valerie Velvet lives in West Berlin, Camden County. She’s a heavily-tattooed, quick-to-laugh mother of three, a grandmother, artist and Philadelphia native who grew up on a “hippie commune” in western Massachusetts. Last spring and summer, she set out to raise monarch butterflies in her backyard garden, a protected habitat out front and inside a kitchen with windows providing the requisite sunlight to make it happen. In her first year, she sent more than a dozen monarchs out into the world and, in a few months, will find out how many of their offspring make their way home, as they are biologically wired to do. After a life of moving back and forth to Massachusetts, she and her significant other settled in Somerdale. She connected with the “little old ladies” with the Valley Forge Audubon Society’s Backyards for Nature program, ordering seeds for the milkweed plants which monarchs need to lay their eggs and help caterpillars to transform into butterflies. Living along the White Horse Pike wasn’t exactly ideal for growth and sustenance, so they moved to “a house with a garden” in West Berlin last May. There, she would have the space needed to embark on the effort full-force. She credited a video from the renowned “Butterfly Lady of Fire Island” as a tutorial, of sorts, on how to get started. “I looked up ‘How to raise butterflies,’ and it brought me to the Butterfly Lady of Fire Island, so I watched her videos and just copied what she did,” Valerie shared in her kitchen last week. “I had the kitchen with the sunny view, I had the time, so I decided to just go for it. The key to the process is milkweed, the sole host plant for Monarchs that comes in two forms: one with orange flowers that resemble little shrubs and another with pink flowers that are tall with slender leaves. Monarchs not only eat the nectar in milkweed flowers, but they leave their eggs in its leaves. She planted several milkweeds at her previous home and brought them along for the move last summer. Early on, she had problems with predatory birds coming in and getting the eggs, caterpillars and chrysalises of both varieties of butterflies. That’s when she constructed some ad-hoc sanctuaries. For one, she refashioned a toddler tunnel “that I snagged at Goodwill in Stratford.” Glass pitchers with milkweed were then placed inside that protective habitat. An old cardboard speaker box served a similar role. Pulling that pair of chrysalises from her kitchen freezer, she showed one that got infested with a fly’s wings and another that succumbed to "black death," a common malady among developing butterflies. • Monarchs need to be well hydrated, but take special care so as not to drown the caterpillars, which cannot swim. • There has to be a constant source of milkweed (or parsley for swallowtails). • Three times a week, she “pulled all the critters attached to a plant, eating away, off and wiped the area down with a white vinegar solution” before putting them back. “They’re s*** machines. There will be green poop balls everywhere,” she said. • Reaching caterpillar form, they need to be monitored as “they will try to get away … Keep track of them. They’re very fragile when they first come out of the chrysalis." From there, you’ll soon see monarch butterflies to call your own. Planning to get started later this month, she already has procured milkweed seeds to expand her effort from the existing perennials. 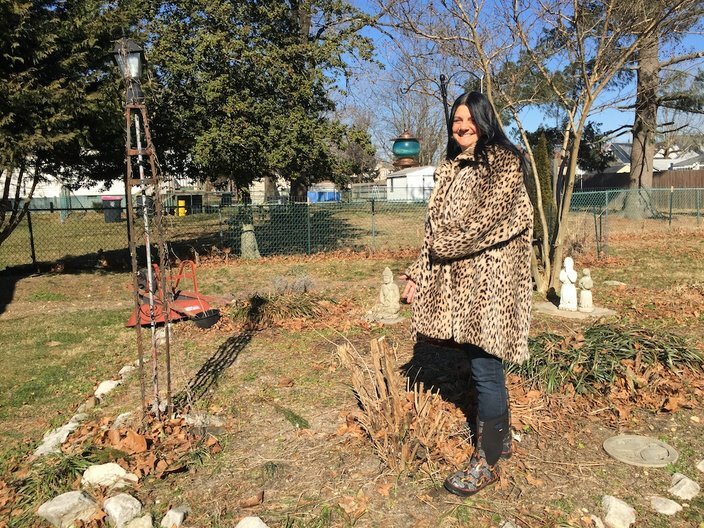 Valerie Velvet stands in the backyard garden that, once temperatures rise, will be home to a habitat for monarch and swallowtail butterflies in West Berlin, Camden County. She realizes what she’s done is a small part of reversing a population decline that she chalked up, in part, to “industrialization along the Canada to Mexico corridor” traveled by migrating monarchs. But if more people followed her lead, the beneficial impact could be much greater. She said she thinks the ones she raised probably made it to the Carolinas, where they’ll mate and – thanks to the wonders of science – “pass the directions along, the maps, the GPS” along to their offspring in the process. While Velvet works to put a tiny dent in the declining population, Gelhaus remains worried that the numbers will continue to dwindle in the future. In other words, this year’s numbers don’t represent a change in the long-term decline. The SaveOurMonarchs Foundation is dedicated to rescuing the endangered species. The foundation sells milkweed seeds on its website. It also has more information on raising monarch butterflies at home. He cautioned that population increases in Mexico may not directly result in more making their way back after winter. When first-generation eggs are laid in the southwestern part of the country, later generations are what we’d see locally. “If they maintain the population there, conditions have to be good as they’re coming back,” he said. The cause of population decreases remains unclear. Some of it can be chalked up to herbicides. When genetically engineered corn and soybean crops become more resistant to herbicide use, milkweed found on the edges of the fields could suffer, causing prime butterfly environments to suffer. Logging efforts near Mexican habitats have also impacted populations, as has climate change. On the bright side, he said that the monarch variety that comes from the eastern United States and Great Plains will not go extinct. Permanent populations that don’t migrate exist in places like Florida. In worst-case scenarios, “we won’t see monarchs in this part of the country” if trends continue. That would mimic what's become of the west coast population. Those monarchs, which migrate to California in winter instead of Mexico, have taken a bigger hit. With more than a million monarchs estimated out west in 1997, “it looks like we’re down to tens of thousands” according to data comparing November 2017 to November 2018. If that continues, “there’s not going to be any left,” said Gelhaus, lauding people like Velvet, who tend to those in their yards and near their homes. Still, the case of the vanishing monarch butterflies – they'll be part of the Butterflies Live! exhibit at next month's Philadelphia Flower Show – is cloaked in mystery.